Spiraea prunifolia.Gary P. Fleming.Atlas of the Virginia Flora.www.vaplantatlas.org.2014. Virginia Botanical Associates, Blacksburg. (Accessed 5/2014). Spiraea prunifolia is a shrub to 3 m tall, stems slender, brown, twigs zigzag, very thin, new growth pale grayish. Leaves alternate, egg-shaped to elliptic to 5 x 2 cm, tip pointed, margin toothed, dark green above, finely hairy below, stalk to 0.3 cm. 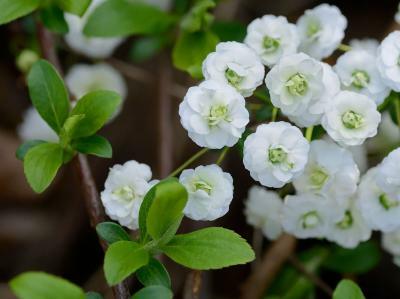 Flowers white, double, to 0.8 cm wide more-or-less ball-shaped with numerous short petals, in clusters of 3-6 at tips of stems, on thread-like stalks to 2 cm long, above a few leafy bracts (Rehder 1986); blooms May. Fruit: Probably not forming seed, since most anthers have been bred to become petals, thus the plant is generally sterile. Frequency in NYC: Very infrequent even as a horticultural planting. Habitat: Generally found at overgrown gardens or planting sites.